Today's mobile movement is all about efficiency and multitasking. But with the first cellphone in 1973, you could place a phone call and get a workout at the same time. After all, the phone weighed 2.5 pounds. 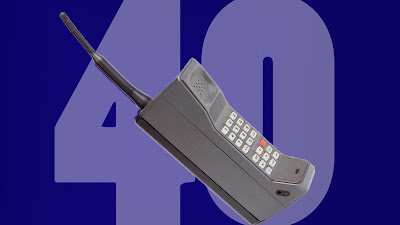 The cellphone turned 40 on Wednesday, April 3. Its creator, Martin Cooper, 84, placed the first mobile phone call on the streets of New York City — he phoned his rival, Joel Engel, head of research at Bell Labs. You can imagine how cheeky that exchange was. Alas, the call couldn't last too long — the Motorola Dynatac's battery life only squeezed out 20 minutes of talk time.